A new bank is open in the former Co-Op Bank on Hoe Street in Walthamstow. HSCB (Hoe Street Central Bank) is part of Bank Job, a project and documentary film asking timely questions about our broken economic system. Until March 25th, the bank will be at the centre of a collective act of - quite literally - printing money and abolishing local debt. 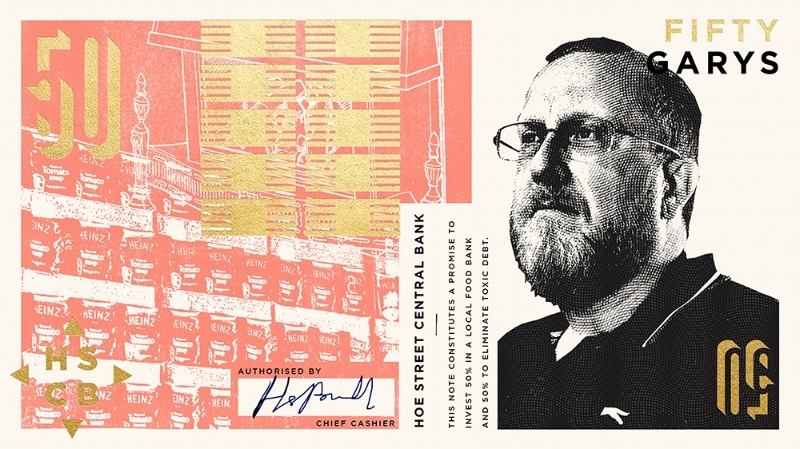 Local people are joining Bank Job founders artist Hilary Powell, printmaker Spike Gascoigne and designer Phil Seddon to print £50,000 of Bank Job currency to help pay off local debts. The twist comes in the design of the money. On each note, in place of the usual Queen’s head, the heads of leaders of local projects will be printed instead. As the notes (actually artworks in their own right) are sold for real pound sterling, they will raise money for each local project as well as the HSCB debt abolition fund, which aims to wipe out £1 million of local predatory debt. Buy the 50 Gary note and £50 goes to Eat or Heat Foodbank. Picture: Bank Job. Sounds complicated? It’s not. Buy the The Gary tenner, for example - and ten quid goes to Eat or Heat Foodbank, headed by said Gary Nash, a charity that provides a food bank to people in Waltham Forest. Get the Saira £5 note - and £5 goes to PL84U AL-SUFFA, headed by Saira Mir and her family, a charity providing hot meals, a friendly environment and gateway to local services for those living in deprivation and isolation. The two other projects are positive youth space The Soul Project and local primary Barn Croft Primary School, a small, one form entry primary school in Waltham Forest. Bank Job’s challenge is to make 13,700 individual bank notes totalling £50,000 worth over 14 days and then exchange this for the money needed to buy up and abolish £1million worth of local payday debt whilst also supporting the four local causes featured on the notes. An accompanying documentary film, Bank Job, is just the second by Optimistic Foundation – a multidisciplinary unit set up by Powell and filmmaker Dan Edelstyn. Optimistic has mileage in crossing genres: Powell and Edelstyn’s first film ‘How to Re-Establish A Vodka Empire’ also expanded beyond the screen into social action and enterprise when the duo set up their own vodka brand ‘Zorokovich 1917’ in a bid to enliven the economy of the post-perestroika village of Dan’s ancestors. Hoe Street Central Bank takes shape. Picture: HSCB. Engaging people in a collective act of printing money and abolishing local debt in a former high street bank is a provocative start to a timely conversation about economic justice. A programme of ‘Money Talks’ ranging from crypto currencies and good credit to debt and democracy brings together big name pundits with local action groups. An Economic Education, on March 15th, for example, saw John Weeks, Professor Emeritus, School of Oriental & African Studies; Reema Patel of RSA’s Citizens Economics Council, Beth Munroe of Shout Out UK and Clare Burkett of Economy, talking about purposefully opaque and disempowering language too often used about the financial system. Art, education, community: if only all banks were like this one. Catch the rest of the programme of talks here.